In 2016, Vivek H. Murthy was the first U.S. surgeon general to release a report focused on substance addiction. In the report, “Facing Addiction in America: The Surgeon General’s Report on Alcohol, Drugs and Health,” Murthy reveals that one in seven Americans will face substance addiction in their lifetime, and only one in ten of those people will receive treatment. We recognize the increased national attention to addiction and also the reality that many families and communities have been struggling for a long time without adequate support and resources. Be Strong Families has been approached by agencies in the recovery community to adapt Vitality and Parent Cafés with a specific focus on peer-to-peer conversations to support the recovery process. We believe that these new Cafés will fulfill a very important need in the recovery process – that of a non-clinical, effective, helpful peer-to-peer support and sustaining motivation for people in recovery, their families, and their communities. We began a collaboration effort, including co-creating a deck of questions and a training institute curriculum with partners who have both lived and professional experience in the addiction recovery field. On March 13-14, teams from Be Strong Families, NorthEast Treatment Centers, and the Greater Tilton Area Family Resource Center met to begin the process of co-creation. Over the course of the two days, we used Appreciative Inquiry to uncover our positive core and discover the best of what is– the strengths, wisdom, experience, passion, expertise, training, and skills that each team member and organization brings to the process. Building on these strengths, we began to dream about the future. Although we began with the hope to create a Café resource for people in recovery, we realized that everyone is in recovery from something in their lives, everyone has something to get past, and everyone is looking for a way to move forward. With this realization, we decided to call them Moving Forward Cafés: Conversations to Promote Recovery and Well-Being. We envision a future where Moving Forward Cafés are an opportunity for individuals, families, and communities to grow together towards positive change. These conversations meet people where they are and affirm that healing is possible regardless of where a person is on their journey toward holistic well-being. Participants learn that they are not alone and find the personal and collective strength necessary to let go of shame, stigma, and guilt and move forward. Physical – What are signs of stress in your body and what do you do? Mental / Emotional - When do you wear a mask to protect yourself and when can you take it off? Spiritual – What are the benefits of forgiving yourself and others? Financial - How do you decide who to share your money with? Environmental – How has your environment helped you move forward? Social – How does honesty contribute positively to your friendships? 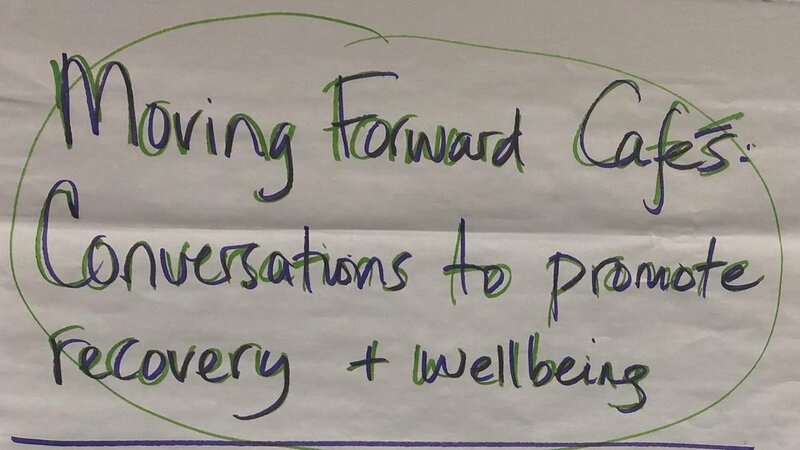 We are looking forward to continuing the Moving Forward Café development process. If you would like to partner with us on Moving Forward Cafés or another Café development project, contact Organizational Advancement Manager Nadia Washington at nadia@bestrongfamilies.org.